This comes in the normal plain cardboard box and inside is the dark pink tissue paper with holographic bits of glitter in it. I’ve ended up using past tissue paper as my background and I think this will replace the pale blue as that’s got a bit messy with the loose pigments I did a while ago. There’s also a sprinkling of Christmas themes glitter which I will be keeping to use for Christmas cards, I especially like the holographic slightly clear snowflakes. Although there’s no shredded paper or extra padding I’ve never had anything break in these so the packaging is great. Going through these I decided that I’m going to smell them, write down what I can smell and then have a look at the official descriptions on the facebook page to see how close I was. I’m not great at describing smells so it might go really wrong but this way I don’t get influenced by what I’m reading and expecting to be there. The first things that I noticed, probably because they’re two of the bigger things in here, are the wax tarts. They’re in brittle form which is great as you get to choose how little or much you want to burn at once and you can combine them if you want. I do love Enchanted wax, it lasts well and seems to have a better throw than the Yankee wax melts I’ve got. 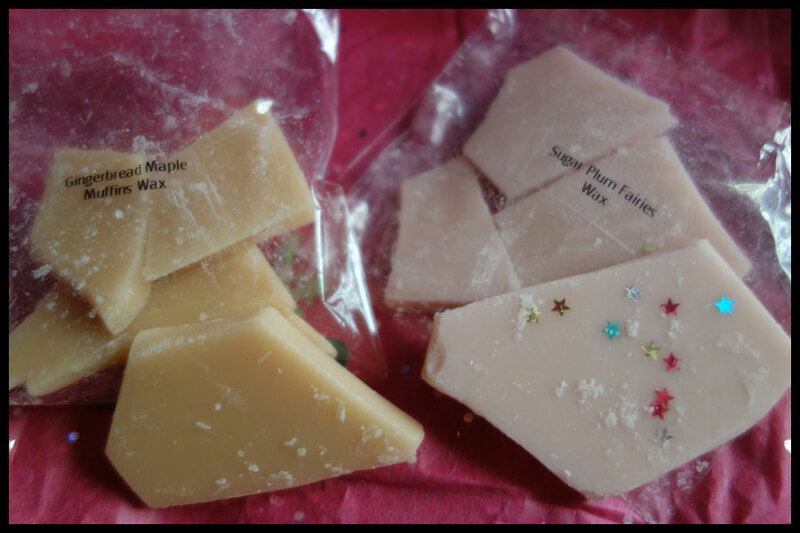 Sugar Plum Fairies wax – I love this smell, it’s not a very Christmassy one, at least to me, but it’s so nice. It’s a fairly sweet scent, it’s got the plum in there and the sugar but there’s something that adds a tartness to it as well so it’s not over the top, I think I smell some blackberry in there. For some reason it reminds me a bit of a lot of rhubarb scented things which I love, a bit like the rhubarb half of a rhubarb and custard sweet. Reading the official description it says it’s berries with berry syrup so there’s no berry in particular but it’s a very nice smell. 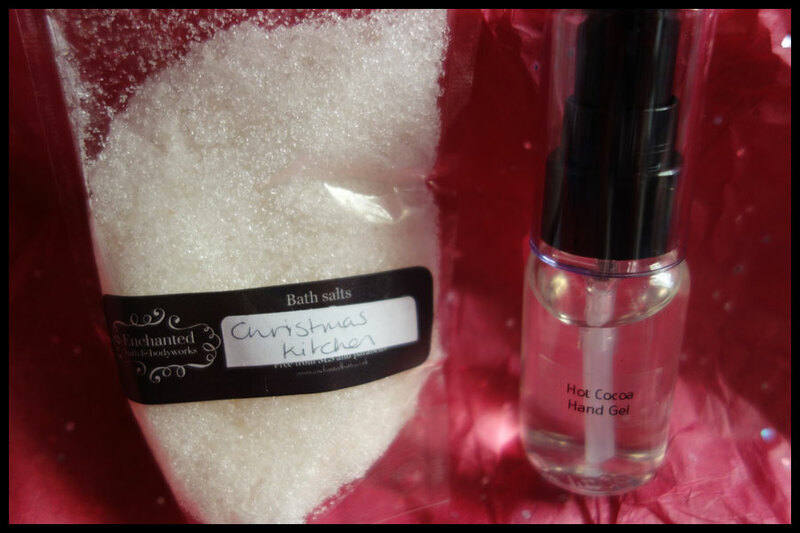 Christmas Kitchen bath salts- I will admit I’m not a huge fan of bath salts but I do use them and these do leave my skin feeling nice. The main scent I’m getting from this is pine, with maybe a hint of something citrus but it’s definitely pine. There are other things that are making it less sharp so I’m going to guess vanilla as that always softens things and there’s a hint of floral to me though I can’t tell what. The official scent says orange and lemon peel in a vanilla cookie base with firewood and Christmas pine. I wasn’t far off so this is true to the description. I won’t say it’s my favourite but if you like pine and fresh scents like that it’s probably a good one for you. Hot Cocoa hand gel – This one does exactly what it says on the tin, or bottle. It smells exactly like hot cocoa, very creamy and milky, like one of the expensive ones you have to mix with milk. I’m not a huge fan of chocolate scented products but I do like this as a hand gel, another that I wouldn’t use to wash with but I do like it in this form. I also love the little bottle, it’s so much easier to use than the FCS ones I have, I’ll be keeping it and putting the others in here I think afterwards. 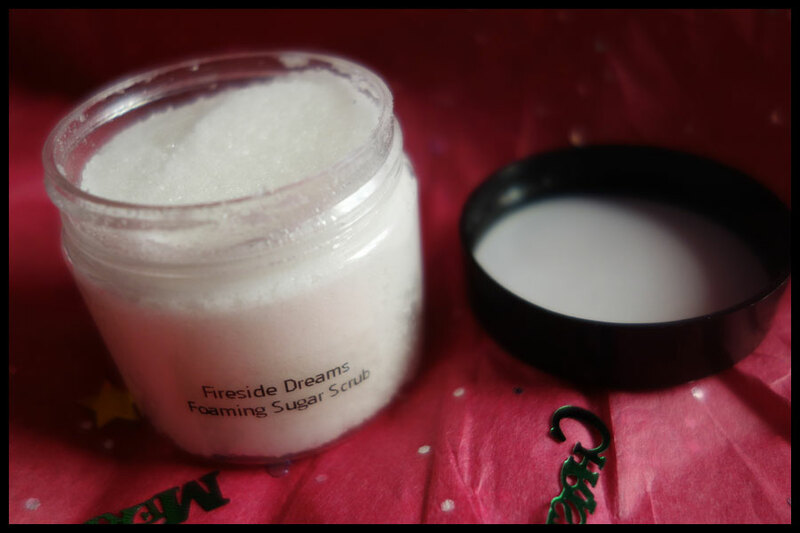 Fireside Dreams sugar scrub – This is one that has confused me, for some reason I’m getting coconut in there and something light and possibly floral or sweet, I’m not sure as it’s sort of hidden, which seems odd for something with this name. The official description says it’s fluffy marshmallows toasted over a fire which I don’t get. Maybe the sweet marshmallow is somehow turning into coconut for me, I don’t know. I do like this scent and now I know there’s meant to be fire maybe that’s the scent I’m getting that’s making me think of floral as it’s well hidden but I still get the coconut for some reason. Sleigh Bells body lotion – I love this smell, there’s something slightly tart and sweet at the same time in it. There’s definitely some kind of berry, maybe something curranty and something sweet so I’m going to guess vanilla again. There’s something else fruity behind all that but I can’t tell what it is. Reading the description it says there’s redcurrant, sheer musk, pomegranate, white grapefruit, wild berries, marshmallows and vanilla so I wasn’t far off. I don’t really get any musky smell from it even after using it on my skin which is unusual as that scent often comes to the front when it goes on my skin and reminds me of my teenage years with white musk and ice musk from the body shop and natural collection. Glistening Snow 3 in 1 (Shower gel, shampoo and bath foam) – This is definitely a Christmas or winter scent, I get some kind of spice from it, one of the normal winter scents but I can’t tell which. I think there’s also something fruity and maybe pine again though I’m not sure as it’s just one of those smells that reminds me of winter. Officially it has bayberry, cinnamon, clove and peppermint. I guess it’s the peppermint and spice combination that’s reminding me of pine maybe and I’m not sure what a bayberry actually smells of but this is very nice scent and it turned sweeter when I used it as a shower gel. Mr Snowman multi use spray – This just smells of hot cocoa again to me, though when it’s sprayed and settled there’s some peppermint I think and maybe something bakery scented in there too. It says this should be the other way round, it’s meant to be vanilla and mint with a dry down of chocolate but it seems to work the other way round for me with the chocolate disappearing and the mint being stronger. Winter Wonderland multi use spray – This reminds me a lot of the Glistening Snow gel, though it’s a bit sweeter and subtler and maybe more earthy. I’m going to go with pine, some sort of resin or amber (I’m never good at guessing them but it has that general scent), something fruity and something sweet in there like vanilla again. The official scent description says it has vanilla and sugar cane, fir tree, rosemary with a hint of Christmas rose, peppermint, resin and teak wood. I do like this scent and it definitely has a lot of layers, the longer it’s on my skin the more the pine and peppermint come out whereas the resin scent dries away. I don’t get any Christmas rose in there though maybe that would come out more in other types of product. Twinkling Fairy Lights perfumed oil – I think this is my favourite scent to have as a perfume. It’s a very light floral scent, though I’m not sure what flowers, it’s not a very Christmassy scent to me but it’s a nice day perfume. I think it’s probably best suited as a perfume as it might be a bit strong and floral for me in anything else, though if you do like florals then this might be a good one to try. The official description says it’s a light floral with musk, though the musk doesn’t come out on me it’s one that might in other scents or on your skin as mine tends to make perfumes smell differently than they do on most people. This post ended up a lot longer than I meant it to! I do like a lot of these scents and think it’s a very well balanced collection with the earthy scents represented as well as sweet, fruity and floral so there’s probably something in there for everyone. I did see the descriptions before the box even arrived, though I had forgotten them before I read them again, and some of them that I wouldn’t expect to like on paper smell amazing, Twinkling Fairy Lights and Winter Wonderland in particular. I am definitely going to be making an order when these go live, I will probably end up stocking up on some of the regular scents too as they’re closing though I will try not to spend too much with Christmas coming up. These do last well and I’ve had scrubs and whipped body washes be fine after nearly a year before now so I’m not worried about them going off in the time that it’ll take me to use them. I know I’ve done a few reviews of her things in the past but has anyone else bought anything from Enchanted before? If you have are there any scents in the regular range that I should be looking at before they go? I have a few I want to get but I always like trying new ones and I’ve often ended up sticking with the limited edition things because they aren’t around for long and then I buy so much I don’t get anything until the next collection is released so haven’t tried many of the regular scents.